Conceptions of nature and naturalness have grown so ragged through contradiction and ambiguity that, as terms, they’ve become almost unusable. This is no deterrent to Swiss artist Vanessa Billy. The title of her exhibition of sculptures and collages at Christina Wilson Gallery earlier this year declared that ‘Natural means something like vegetables’. This guilelessly simple statement is, for Billy, a characteristic blend of irony and sincerity. As she sees it, ‘natural’ does mean something simultaneously as earthy and as cultivated as vegetables; naturalness inheres in matter, and extends to everything around us. Billy sees it as her job to point this out. Take, for instance, her work Wait, Sit, Converse (2009). 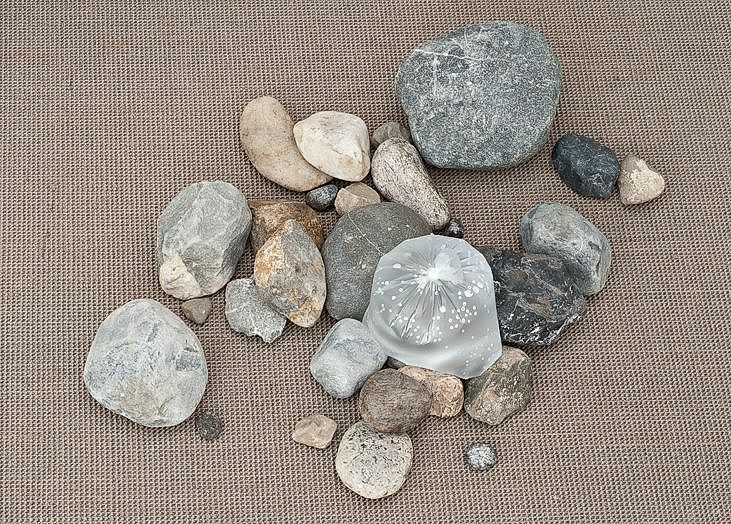 A fist-sized rock and a similarly-sized lump of concrete sit either side of a sealed bag of water. A conversation begins between them: the rock was shaped by years in a river, and the concrete via the addition of water to cement and powdered rock. The bag of water is shaped by gravity and – marginally – by the solid lumps pushing against it from either side. No element is wholly artificial, nor is it an untouched gift from ‘nature’ (the precision of the artist’s selection is central to the work’s poise). It is no more or less natural than a vegetable. If this minimal, rationalist arrangement summons the sound of rushing Alpine streams or awesome geologic timescales, that is no accident; Billy (who currently moves between Zurich and London) espouses a view of landscape that is informed as much by glaciers and lakes as it is by the Sublime backyard experiments of Roman Signer or Fischli and Weiss. Billy does not see herself as a Romantic, however, so much as a pragmatic craftsperson. She rarely uses hidden means of fixing objects together, nor does she paint or otherwise decorate her sculptures. Their physical tensions are always evident on the surface, as with Dry Stamina (100 litres) (2011), a bank of sand at the base of a wall which cracks and collapses as the exhibition progresses, or You Twist, I Turn (2009), two wheels of concrete joined by a torqued umbilical cord of towelling embedded in each of their centres. Such works display awareness not just of their own pasts, but also of their imminent futures. Everything in Billy’s work is in motion, and if it sometimes looks a little tatty or mouldering, then that is just a taste of what more is to come. Her exhibition at Kunsthaus Baselland earlier this year took a single day as its temporal framework. Its title, ‘Three Times a Day’, suggested the regular ingestion of medicine or food; the three sequential rooms of the gallery each contained, amongst other things, similar steel three-legged structures that were titled: Starting where the previous day ended, Throughout the day, and At the end of the day (all 2011). Over the first of these was draped a rope tied, at one end, to an empty can, and, at the other, to a rock that hovered just inside the can, hanging in perfect equilibrium. The second was wrapped with stained towels and the last was almost bare, a single scrap of shredded brown fabric dangling from its upper rim. The narrative arc here seems to develop from a situation fecund with potential to the exhaustion of available resources; it’s a particularly bleak statement from Billy, who is more usually prone to finding redemptive beauty in dilapidation, and insight through material transformations or formal coincidences. Although Billy’s art emerges from found objects claiming to be nothing but themselves, it concerns distinctly human problems. For example, the body makes itself felt in Columns (Learning from history) (2011), in which classical columns are made from stacks of the heaviest cast sections that the artist can lift; and Torso (2009), a figurative joke in which a cement block is dressed in a vest-like plastic bag. Billy is at her best when she disproves our preconceptions about the material world – as with her video Hands Bar (2010), which reveals the flexibility of a metal bar beneath the steely grip of a gymnast swinging beneath it. Sometimes her povera constructions achieve something like magic, as with the mysteriously solid volumes of water, ink and oil in Surfaces for the mind to rest or sink into (2009). All of these works draw meaning from relationships, either between two objects or objects and people. Even Billy’s collages usually combine only a couple of sources or, as in recent works, an image and overlaid text. Her sculptures are active agents that appraise each other – as well as intruders into their space – with the same diffidence with which we regard them. This is particularly obvious when they’re spread across the floor or lean in corners; they see us before we see them. A number of works in her Kunsthaus Baselland show, such as Grounds I and Grounds II (both 2011), were made from the same carpet that the gallery is furnished with. The wire mesh stretched between tree trunks for Two Trees I and II (Regent’s Park) (2009) was, from some angles, almost invisible. It was a physical description of a relationship between two bodies, and the net into which looking makes us stumble.